Snow falls occasionally here in Northern Virginia, usually no more than about 4 or 5 inches at a time, and it’s a chance for fun followed by a quick melting, but we have more than our normal share of snow this winter. We still have plenty of snow on the ground leftover from the back-to-back blizzards two weeks ago, which dumped almost 30 inches on us. 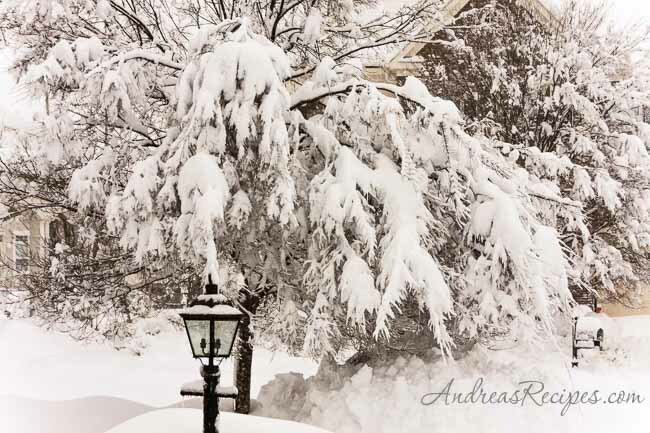 The DC area set a new record for winter snowfall, beating the previous record set in the winter of 1898-99, and our county has received over 75 inches this winter, far above our average of 23 inches. Just yesterday I finally saw some grass peeping out from beneath its heavy white blanket, a sign that our winter may yet return to normal. 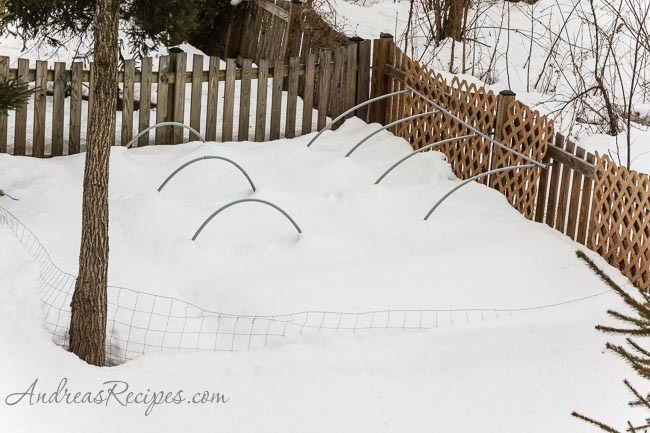 Though the snow is down about a foot from a week ago, the garden is still buried and we haven’t been able to start spring preparations. I predict a very messy mud season to come. Summer seems very far away. Though we are frozen indoors this winter, we have been able to enjoy the fruits of summer using the garden produce we preserved during the season. In summer and autumn we process large amounts of homegrown basil into pesto and freeze it in small containers for winter meals. This month we experimented with our frozen sun-dried tomato pesto in hummus, a variation on our slow roasted tomato hummus, but a basic basil pesto will also work. Though we have months to go before smelling the scent of fresh basil in the garden again, the flavor reminded us of the warm summer to come. This is my contribution to Grow Your Own, a blogging event that celebrates the dishes we create from foods we’ve grown, raised, foraged, or hunted ourselves. Nate and Annie of House of Annie have graciously volunteered to help out with Grow Your Own while we tend to some family matters this winter, and they are our hosts for this round, so be sure to visit their blog for more information about submitting your post. If you are new to the event, you can read more about the rules for participating at the Grow Your Own page. In the bowl of the food processor, add the beans, tahini, pesto, and garlic. Process for a few seconds to get the mixture started. While the processor runs, begin drizzling in the seasoned olive oil, starting with 2 tablespoons, adding more as necessary to create a smooth paste. 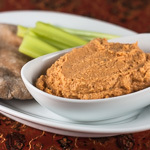 Serve with raw vegetables, whole wheat pita chips, or baguette slices, and also good as a sandwich condiment. 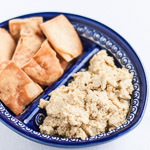 Hummus is one of my favorite foods but for some reason, the first time I made it, it was wonderful and every time after that has been awful! I don’t know why I can’t seem to get the texture or ingredient proportions right. Warmer weather does seem far away, but we had a hint of it this weekend. I’m now planning ahead and thinking of buying a freezer chest, so that I can store more items from the farm that will last me through next winter. You snow photos remind me of our snowfall at the beginning of the year in London – unusual for us! Beautiful but makes one long for the summer after a few days. I like your twist on the hummus. After many frustrating years, I’ve learned to harvest and put up my foods in much smaller quantities. Makes all the difference in the world and no waste! I’ve been in one Northern Virginia 26″ incher blizzard. Gives one a whole new appreciation for Washington at Valley Forge, eh wot? And, of course, the spring will brings tons of water and flooding. 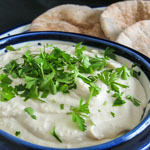 Have some more hummus. thnx for the great information! Snow seems to be everywhere, here in Munich, Germany we have our share. This sounds really tasty. Looking forward to sampling in my future. this would be good on a German pretzel! That snow looks beautiful! We need more of it here on our ski mountains! 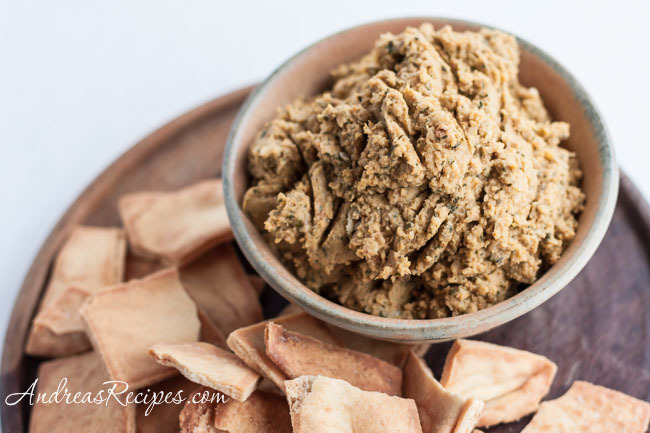 I have been in a really hummus mood lately and have been wanting to make a homemade sun-dried tomato pesto – this looks like a good place to start!